Hilltop Unit is a medium security prison for women located in Gatesville Texas. The facility opened in 1981 and was originally designed to house male offenders. Hilltop Unit was eventually converted to an all female facility and today can house a maximum of 341 females in the main unit and an additional 212 female inmates in the Trusty Camp. 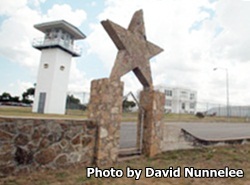 The prison derives the name "Hilltop" from it's location, which is one of the highest points in the region. Hilltop Unit is reportedly haunted, and many unexplained occurrences are often attributed to the spirits of the boys who were housed in the reformatory in the late 1800's. Hilltop Unit employs inmates in an agricultural operation that includes feeding and caring for pigs and horses. The horses are utilized by many of the surrounding prisons in mounted patrols. Other responsibilities for Hilltop Unit include serving as a fuel depot, and maintenance and repair of many correctional vehicles. This facility also operates a garment factory which employs many female offenders, and helps to create many staff and prisoner uniforms. Hilltop Prison Unit offers a program for young female offenders, which serves to modify poor behavioral patterns and provide substance abuse treatment. Educational programs at Hilltop include literacy, adult basic education and GED courses. Vocational training is provided in business image management, and culinary services. Offenders can also participate in life skills courses, parenting classes, support groups, and various programs that give back to the community including the Girl Scouts Behind Bars and Storybook project. Hilltop Unit holds visitation for inmates on Saturdays and Sundays from 8am to 5pm. Visitors may bring a clear Ziploc bag with up to twenty dollars in quarters with them to use in the vending machines. Visits are up to two hours in length if space permits.